Affiliation: Department of Electrical Engineering and Computer Science, Massachusetts Institute of Technology, USA. Optical spectroscopy is a powerful technique that has found widespread application in fundamental science and in fields ranging from biochemical sensing to optical communication. In recent years, there has been strong interest in developing compact spectrometers for portable applications. A typical spectrometer uses a dispersive element such as a prism or a grating to separate the different constituent colors or wavelengths of light, each of which is channeled into separate detectors. Accordingly, a spectrometer can better distinguish different wavelengths of light if the distance between the dispersive optic and the detectors is increased. High-resolution spectrometers tend to be bulky, and miniature spectrometers based on the traditional design have so far not overcome the trade-off between footprint and performance. 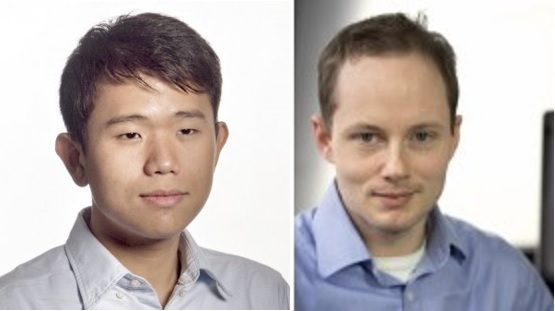 April 05, 2015: "Efficient Photon Collection from a Nitrogen Vacancy Center in a Circular Bullseye Grating in Diamond" by Luozhou Li, Edward Chen, Dirk Englund. 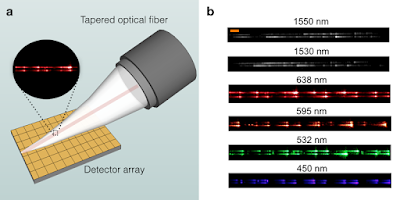 In our work, we show a spectroscopy technique that circumvents the traditional spectrometer principle, leading to a millimeter-long fiber spectrometer that is simultaneously compact and has high spectral resolutions . A waveguide such as an optical fiber allows only specific spatial distributions of light, or modes, as given by Maxwell’s equations. When multiple modes are launched into an optical fiber, they constructively and destructively interfere, resulting in highly random but specific intensity patterns (Figure 1). Additionally, by tapering the optical fiber, we were able excite different modes along the fiber, thereby further increasing the spectral resolution over that of an un-tapered, straight waveguide. More importantly, the taper geometry facilitates the detection and measurement of the multimode interference signals. Figure 1: Click on the figure to view with higher resolution. (a) Illustration of the tapered fiber multimode interference (TFMMI) spectrometer. (b) Measured interference signals of different colors or wavelengths of light. As modes of different wavelengths do not interfere, the interference can be regarded as the fingerprints of their respective wavelengths. By first mapping every wavelength of light to its fingerprint, the device can then algorithmically solve the inverse problem of determining the composition of an input light. Using our tapered fiber spectrometer, we were able to distinguish wavelengths separated by 40 picometers and 10 picometers in the visible and near-infrared regimes, respectively. Figure 2: Click on the figure to view with higher resolution. (a) We determined the spectral resolution of the TFMMI spectrometer by resolving two closely spaced spectra. The device clearly resolved two wavelengths at 637.96 nm and 638.00 nm but did not fully resolve input wavelengths of 637.00 nm and 637.02 nm, bounding the resolution to 40 pm at these wavelengths. (b) The TFMMI device reconstructed a continuous signal with good agreement with that obtained from a commercial spectrometer. With an optical fiber as our multimode waveguide, we were able to perform spectroscopy on light with wavelengths ranging from 500 nanometers to 1600 nanometers but in principle, our design can be implemented in a large variety of waveguides for any operational regimes. By suitably choosing the material, for example, compact spectrometers for absorption spectroscopy in the mid-infrared can be achieved. The proposed spectrometer can be realized on-chip in volume production through photolithography or printing and may also lead to the development of designer spectrometers for fundamental science, integrated photonics and lab-on-a-chip applications. 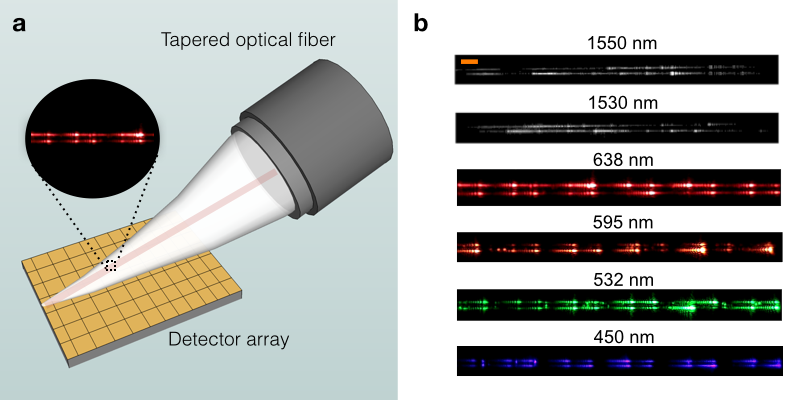 Noel H. Wan, Fan Meng, Ren-Jye Shiue, Edward H. Chen, Tim Schröder, Dirk Englund, “High-resolution optical spectroscopy using multimode interference in a compact tapered fibre”, Nature Communications, 6, 7762 (2015). Abstract.